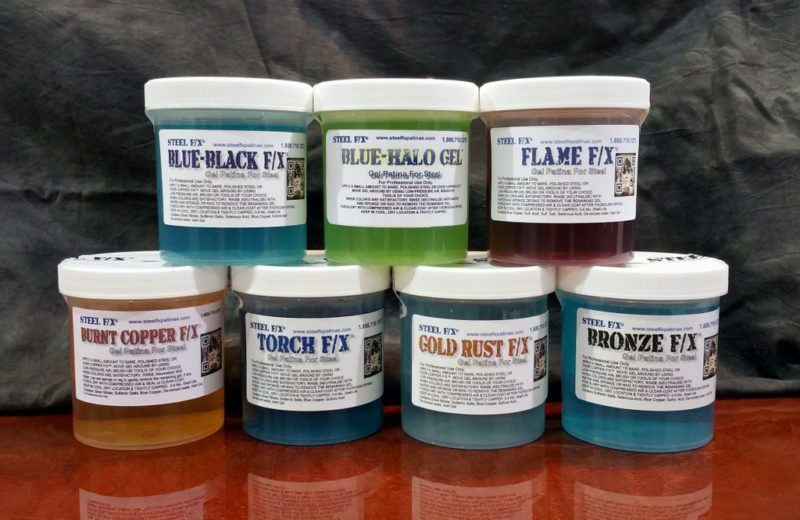 BLUE-BLACK F/X™ GEL PATINA, Now Available in 6 Sizes! BLUE BLACK F/X™ GEL is One of My Favorite “Go-To” Gels When I’m Re-Creating a Color Case-Hardened Patina Effect on a Firearm Part, Knife Blade, or Even Artwork. STEEL F/X® Gel Patinas are About the Same Viscosity as Room-Temp Honey*. The Gel Patinas Allow Exact Placement of Color/s, and by Placing a Very Small Amount (1/4 tsp. or so) on the Steel, Then Moving it Around a Little With Canned-Air, Airbrush (Air Only, No Fluid), or a Small Artist’s Brush, Piece of Foam/Sponge (I Like the Natural Sea-Sponge), You Can Create Beautiful Marbling, Mottling & Patina Effects, Swirls, Color Case-Hardened Appearance, Random Patterns and More! Then, as With All the Patinas, Rinse (Neutralize) With Water, Dry With Clean, Oil-Free Compressed Air and Either Add More Patinas or Dyes if You Need to Intensify Your Work. Rinse Again, Dry Thoroughly & Your Piece is Ready for Clear-Coating or Sealing. 16 Oz. is Enough To Do Dozens of Pieces With Extremely Unique Marbling and/or Patterning. Can be Used on Bare Steel or Over the Other Patinas For Amazing Special Effects & Customer Dazzling Results. *All the Gel Patinas Are a Little Thicker in Cold Weather & a Little Thinner in Hot Weather, Which is Normal. The Viscosity Won’t Change the Effectiveness of the Products. 2 OZ., 4 OZ., 8 OZ., 16 OZ., 32 OZ. I’m an FFL licensed and certified gunsmith. I specialize in repair, restoration and renovation of older firearms and relics. I’ve revived late 1800’s S&W top-break Schofield’s to WWII Japanese Arisaka’s and late model Remington rolling block rifles and shotguns using various products and some parts I’ve had to machine on the lathe. I recently used your BLUE-BLACK F/X GEL PATINA to blend and match the case hardened finish of a beautiful 1927 Ithaca double barreled shotgun that someone had used Brasso and stripped some of the bluing away from the receiver. Your product did an amazing job and I couldn’t be happier nor could my client. Thank you for creating such a valuable product. I don’t know how this product will stand the test of time in the field because he uses it for duck hunting and it will get quite a bit of exposure to the elements. I’ve treated the shotgun afterwards with Frog-Lube and hopefully that will provide some additional protection form the elements. The photos are awesome! Ya know, I built into my site a “premium” level ‘Reviews’ element about a year ago, and since then I’ve rec’d ZERO reviews. I’ll have to check into why this is happening. You’re the first to tell me that you tried & it wouldn’t go through…I just thought no one wanted to take the time to post a review. With that being said, I just checked the BLUE-BLACK F/X™ GEL page, and saw no pending reviews…(they have to be approved by me before they go ‘live’…). Was that the product/page where you tried to post a review? I can’t post your comments as a review, as it will show up as ‘Bill Worden’ , as the customer. But, I’m grateful that you took a few minutes to contact me & I thank you for the photos and kind words.